In this post we will be discussing about creating bouncing ball animation using HTML5 canvas element. 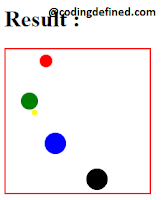 Like Basic Animation using HTML5 Canvas Element, here also we will use requestAnimationFrame. which will tell the browser that you wish to perform the animation and it also requests to update an animation before the next repaint by the browser. In the above code we have written a draw function which will create the ball according to the radius and color provided. Note we are saving the context at the first line and then restoring it at last line of the draw function, because we do not want our context to get updated with the color supplied. Context saved will be stacked, the last one that has been saved will be restored by the next call to restore(). So it is very important to have one restore with every save.